All I had to do was draw a box. Unfortunately, I never read the instructions. 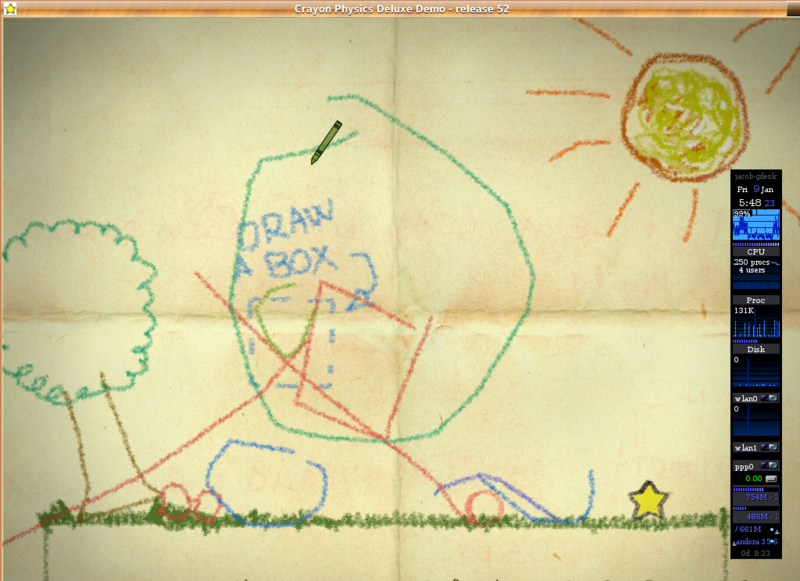 This is my first attempt at playing Crayon Physics Deluxe. WINE runs it quite nicely, and despite the requirements being the latest and greatest video card with tons of RAM (OK, only 64MB of video RAM) my little cheap 16MB Intel Integraeted i915 graphics chipset survived quite nicely. Even the music played without a stutter, for the most part, despite my old 1.8GHz P4. Try this great game, one and all, you computers young and old! Is There A Master Plan, Bob? On a whim, I checked his website again today. It’s back, but the text that was originally causing me to worry is now part of a post amoungst the rest of the posts. Someone at gp32x.com suggested this all might be part of the release of the game, and it’s in fact planned. I thought he was completely wrong, because he appeared to be destroying his room, his reputation, and his communications with Nintendo. What was supposed to be an epic story of a single developer creating a full-scale Nintendo DS game all on his own has turned into a mess. First, it was a protest because apparently no one was communicating with him to continue the publishing process. Then, it was a crazy letter to his fans, full of frustration, and a rather scary self-examination (read paragraphs 4 and 7). Now? Just look at his website. I fear we may never see Bob’s Game ever released in the public.